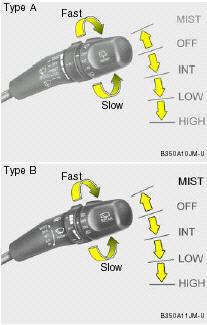 A : Wiper speed control: · MIST – Single wipe. · OFF – Off. · INT – Intermittent wipe. · LO – Low wiper speed. · HI – High wiper speed. B : Intermittent wipe time adjustment. C : Wash with brief wipes. D : Rear wiper/washer control: · – Spraying washer fluid. · OFF – Off. · INT – Intermittent wipe (If installed). · ON – Continuous wipe. · – Wash with brief wipe. 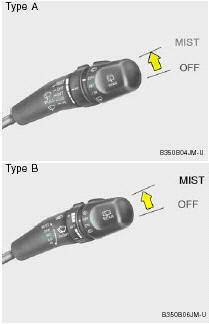 MIST : For a single wiping cycle, push the lever upward and release it with the lever in the OFF position. 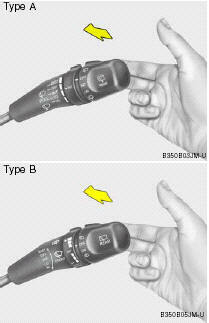 The wipers will operate continuously if the lever is pushed upward and held. OFF : Wiper is not in operation. INT : Wiper operates intermittently at the same wiping intervals. Use this mode in a light rain or mist. 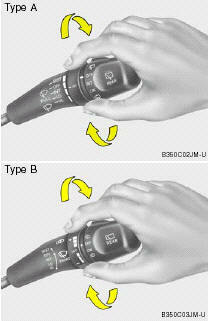 To vary the speed setting, turn the speed control knob. LO : Normal wiper speed. HI : Fast wiper speed. To use the windshield washer, pull the wiper/ washer lever toward the steering wheel. When the washer lever is operated, the wipers automatically three passes across the windshield. The washer continues to operate until the lever is released. NOTE: o Do not operate the washer more than 15 seconds at a time or when the fluid reservoir is empty. o In icy or freezing weather, be sure the wiper blades are not frozen to the glass prior to operating the wipers. o In areas where water freezes in winter, use windshield washer antifreeze. 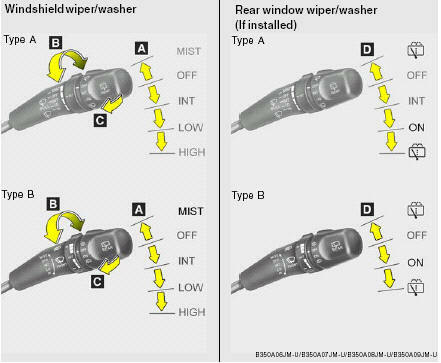 If a single wipe is desired in mist, push the windshield wiper and washer control lever upwards. 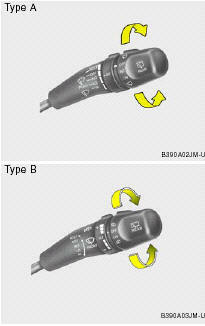 To use the intermittent wiper feature, place the wiper switch in the "INT" position. With the switch in this position, the interval between wipes can be varied from approximately 1 to 18 seconds by turning the interval adjuster barrel. : The rear window wiper starts to operate three times after the washer fluid sprays onto the rear window. OFF : Wiper is not in operation. INT : The interval between wipes operates every 5 seconds intermittently. (If installed). ON : The rear window wiper starts to operate continuously. : The washer fluid will be sprayed onto the rear window and the wiper operates while the rear window wiper barrel is placed in this position. Do not operate the washer continuously for more than 15 seconds or when the fluid reservoir is empty; this could damage the system. Do not operate the wiper when the window is dry; this can result in scratching as well as premature wiper blade wear.